The National Register Historical Marker stands in front of the Pound. 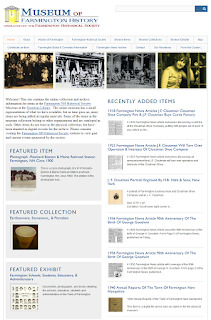 The Farmington Town Pound was placed on the National Register of Historic Places in 1993, qualifying under criterion A for significance in exploration/settlement for the time period 1823, its date of construction. The pound retains integrity of location, design, setting, materials, workmanship, feeling, and association. Twenty-two towns in the Farmington area were surveyed in order to assess their respective town pounds. Thirteen towns no longer have pounds. Of those which have, two survive only as ruins (Barrington and Madbury), one was dismantled and re-erected on a new site in 1946 (Milton), five have pounds in fair to good condition (Farmington, New Durham, Gilmanton, Wakefield, and Wolfeborough), and one (Durham) has a very well maintained pound, in excellent condition, having been restored in 1805 and also in 1905. Among the elements of rural life which the first English settlers established on our shores was the town pound. As early as 1635 the Massachusetts Bay Colony was ordering towns to construct pounds to which untended hogs were to be taken if they came within a mile of an English farm. Within a few years of settlement in 1638, Sudbury, Massachusetts saw fit to appoint six hog wardens to be followed by the erection of a pound. It was 25 to 30 feet square, of post-and-rail construction, and located at the village-end of the "general field". The Town Pound lintel stone fell sometime after 1975. Hampton, New Hampshire, was also settled in 1638. From the outset the colonists sought to acquire livestock and build up their herds, salt-meat being among the earliest farm commodities to be exported. Three years later, the inhabitants voted at town meeting to build a pound about thirty feet square to be built of sawn rails and posts; three men were to fell trees for the project. In February a crew of eleven men built the pound. A gate was made and a townsman appointed hayward and pound-keeper for the year. His fee for impounding "great beasts" was to be tuppence each, one penny per head for "small cattle". The form of these early New England settlements usually followed the English village pattern of houses closely set along the village street or streets on their home lots, each large enough to accommodate house and barn, garden, livestock pens, and orchard. All remaining land in the town was known as "the Common", various areas being set aside for uses to which they were best suited: marshes for haying, forested upland for wood cutting, old Indian fields for crops, brush and open woodland for pasture. The usage of Exeter, New Hampshire, illustrates how livestock were managed in such a village. In May of 1649, Gowen Wilson was appointed cattle driver. Every morning he collected and drove all the village livestock down the street and out to the woods. After a day of tending the herd on the Common, the driver would drop off the animals at their respective byres in the evening. Haywardens and fencekeepers saw to it that gardens, orchards and croplands were fenced in against roaming animals. As geese, goats, sheep and swine were added to livestock holdings, so was damage to field crops and gardens - hogs were especially troublesome. Their control would be the subject of heated debates at town meetings for more than two centuries. In this environment, the pound-keeper provided a very necessary function. He rounded up and impounded strays, fed and watered the impounded animals, notified owners to reclaim their animals by a certain date, animals being identified by earmarks, collected pound fees and saw that injured parties were indemnified. The Hampton and Sudbury pounds of post-and-rail construction probably differed little from the livestock pens of individual homesteaders. Modifications of this design would take place in the New England environment, however. As settlements pressed further inland, the Common no longer provided the saltmarshes, old Indian fields and open woodland resulting from Indian seasonal burning that early coastal settlements enjoyed. Livestock, save family milk cows, were left to run free in the woods for half a year or more. Such animals were no respecters of fences and resented being penned. Town histories often record the replacement of an earlier wooden pound by a stone pound: Milton 1804-1823, Farmington 1802-1823, Lee 1784-1802. Stone lintels over gates and massively thick and high walls suggest that they were indeed required. In 1718 the Province of New Hampshire put into law "An Act for Providing of Pounds, and to prevent Rescous, and Pound Breach." A brief summary of its provisions gives one an insight into the workings of the pound as an institution. The Province required every town to maintain a pound at public expense. If the poundkeeper or hayward was not available anyone could impound a trespassing animal "damage feasant." Any swine at large, unyoked and unrung, was impoundable. The impounder was obligated to notify the owner, if known; if unknown, notice was to be posted in a public place and the matter "cryed abroad" locally and in two neighboring towns, livestock recognizing no boundaries. If the town, by majority vote, fenced in the better pasturage on the common for the use of milk cows, any other animal breaching the enclosure could be impounded. Fees were set for feeding and watering impounded stock, for bringing the animals in, for admission and release of livestock. Impecunious youths could be jailed for unlawful release of animals. Unclaimed livestock could be claimed as indemnity by injured parties or auctioned off by the town. After Independence, this legislation was brought up to date in 1791 with "An Act Regulating Pounds". The State reaffirmed the requirement that towns maintain a pound, but added penalties for failure to comply with additional fines for each year of noncompliance. In poundless towns, anyone could impound a trespassing animal to his own pen or barn, but the owner was to be notified promptly. Neglecting impounded animals on the part of the Pound-Keeper was an actionable offense. Unclaimed stock was to be disposed of by the Town after four days. Anyone attempting to seize animals being driven to the pound (Rescous) or interfering with the hayward or pound-keeper in carrying out his duties could be fined. An impecunious pound-breacher might spend up to sixty days in jail or be flogged with 30 lashes. Fees were spelled out in detail. In 1797 an addition to the statute dealt with pound-breach; illegally released animals, if found within six days by the impounder, could be reimpounded with a doubling of pound fees. Should the owner of the enclosure refuse to give them up such action was to be considered sufficient evidence to convict him of pound breach. Thus, in farming communities, the perennial problem of straying livestock gave rise to the institution of the town pound with its laws, officials, and schedules of fees and penalties. New Hampshire's earliest pound is that of Durham constructed in 1705, repaired in 1805, and restored in 1905. 8 In 1923 a pen sketch of this pound appeared in one of Wallace Nutting's publications of photographs celebrating the beauty of rural New England. Wolfeborough has had four pounds; the first built of logs in 1771 was twenty feet square and seven feet high. In 1799 another was built on the meeting house lot; built of stone, it was thirty feet square and topped with wood timbers one foot square - cost $14. Two pounds were built in 1814; one was thirty feet square on a forty foot square lot. Its stone walls were three feet thick at the base, two feet wide at the top, it was also capped by one foot square timbers. Complete with gate and lock it cost $25. The other, similar in design was still standing in 1901. After a decade of settlement Rochester was incorporated in 1737. The first Pound-keeper was named, the pound to be built near his house. In 1786 a pound was built on Haven's Hill. The question of yoking swine was hotly debated and finally settled in 1823 - hogs to be yoked and not allowed to run at large. In 1841 a new pound was built near the meeting house on the Common. In some years the offices of "saxton" and Pound-Keeper were filled by the same man. In Concord two field-drivers were appointed and a pound ordered to be built in 1729. The following year, the pound was built and one of the field drivers named Pound-Keeper; this pound stood on Pond Hill. The last pound to be built in Concord was erected at the Poor Farm in West Concord in 1830 for $62.50. Though soon falling out of use/ it stands today. During the nineteenth century as industrialization proceeded apace and farming declined with the opening of the West, the Pound became obsolete in many New Hampshire towns. The State Legislature in 1877 amended the statutes relating to Pounds accordingly: "Any town in this State, at any meeting duly called for that purpose, may vote not to maintain a public pound in said town and to dispose of any land held by them for that purpose". In 1889 Hancock voted to dispense with the pound and donate its stones for construction of the basement of the new schoolhouse. The pound had been the first structure voted on at the town meeting of 1785. Voted that the Pound be built as near the center of town as a convenient plot of ground can be obtained and the same be built of stone. Voted that the selectmen be a committee to locate the Pound and let out the same to be built by contract and make a report at the adjournment of this meeting. At the adjournment of May 25, 1822, it was reported that a plot had been purchased of Hunkin Colbath, Jr. for $5. ; it was 130 wide by 120 feet deep. A contract was let out for the stone pound to be completed by June 1, 1823. The selectmen were paid $6. for their committee work. Storekeeper Joseph Sherburne was paid $2.84 for spirits, in part to sustain the energies of the pound builders. Nicholas Colbath was paid $59. in part for building the pound (the amount of full pay is missing). John Roberts was named pound-keeper for the year 1824. Farmington town records for 1878, in addition to noting the appointment of the pound-keeper and two fence-viewers, carries the following, probably inserted by the pound-keeper. "Astray Sheep! two ewes, two lambs found damaging enclosure - Frank Emerson. Found -one South Down buck. Owner can claim after paying charges." Orrin P. Giles. By 1918, the pound was obsolete, and the pound lot had reverted to private ownership when it was purchased by the Raab Family from North Dakota. 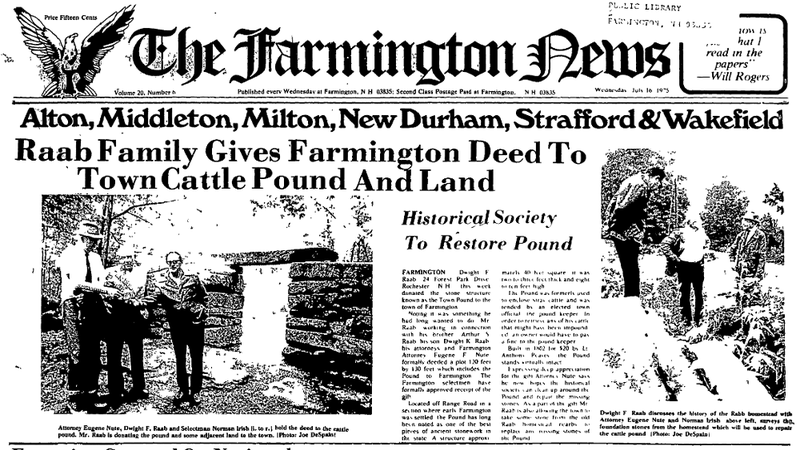 In 1975 the Raab heirs deeded the town pound and lot to the town of Farmington. 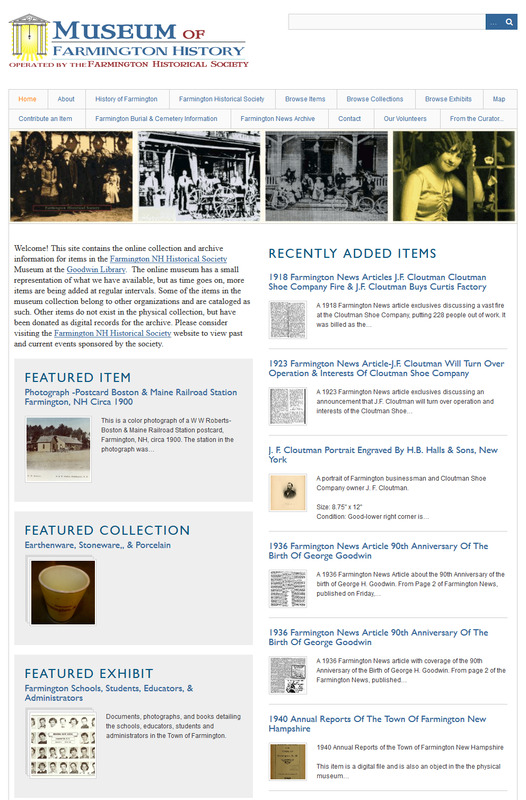 The Farmington Historical Society then undertook to clear the brush and litter from the site. There were plans to restore some of the fallen masonry, but when a new sign marking the site and a newly installed gate were vandalized all further attempts at restoration ceased. An article in the Farmington News of July 16, 1975 on the Raab grant includes a photograph of the entrance to the pound with the stone lintel still in place. The front page of the July 16, 1975 edition of the Farmington News. The Descriptive Narrative was taken from the 1993 nomination form for placement on National register of Historic Places.